A great piece of equipment for parents and school or clinic based OT's and PTs. When put together, you have a soft foam ball attached to a length of rope, which is attached to a height adjustable central pole. 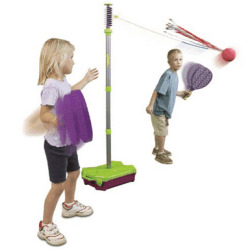 Using the two included rackets, children play together or alone, trying to hit the ball around and around. Use inside or out to work on visual tracking, timing, arm strength and generalized endurance and fitness. Made of lightweight plastic, all the components can be easily fitted back into carry case, which also acts as the stand.